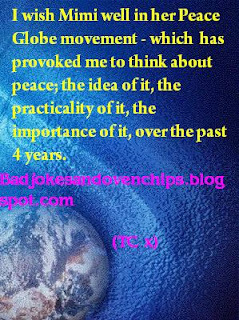 Peace is worth thinking about. Well done and may your day be filled with peace. I tried to start up a new blog recently, but, unbelievably, after only a few posts, I managed to break it!!! I switche from new template, to old and back to new...and somewhere in that hides all my old posts ! :-D And also somewhere in that lies a few recent posts I can't get to. I've decided my old haunt, while it might have certain problems attached to it, is the best haunt I ever had...it's where my friends could find me, and when I went out and about, they could see who I was. So, here I am, back again, and wondering what you've been up to all this time. I hope you've been well and happy,, and life is good to you! There is so much I want to say, but I think I'll leave it for another day...today is left for peace. You are so right about people's opinions, and the right to different opinions. My kids hate it when I say, 'let's agree to differ'! They want me to change my mind and get angry when I don't. I guess we adults do that too. Take care for now, and may peace find you and yours! I like both of your globes but especially the one dedicated to Mimi. That was very thoughtful (and I wish I had thought of it *grins*). Love the messages on your globes. I too believe that tolerance and understanding are the building blocks of peace... and it does matter if you reach even only one person, because there's no telling how long the chain of peace might become. Your questions are so valid. I ask them myself when I encounter someone who has a different idea than I do. Thanks for the dancing link! I participated too and think it a worthy thing to do. Maybe it will get someone to stop and think. It's worth it if only one person makes a small change. If I provoked you, then I'm not sorry and I mean that sincerely!! 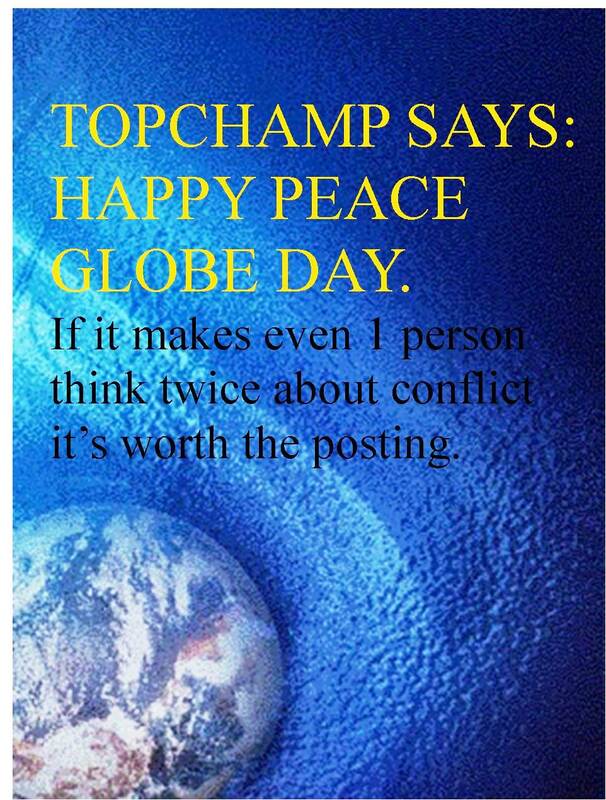 (grin) I have never forgotten your very first peace globe and how colorful it was with the yellow horn proclaiming "pace" and how excited I was to get one from Scotland. I considered you a mover and a shaker, yes, I did. So now you have moved ME. Because sometimes ...shhh...don't tell...I ask those same questions and I tell myself that if even one person ponders a thought of peace, what it means and all the rest you said, then it is worth it. So you have proven that what WE do is relevant, thought-provoking, timely, human, huge. 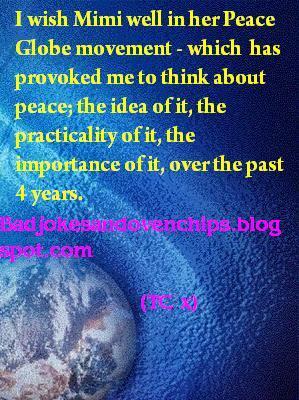 Not because it is "my" movement but because the peace is moving...and moving...and causing all of us to think. Perhaps in all the thinking we will discover a cohesive solution beyond puff and fluff words on a page. Not that anything I've read here or in this movement has been anything of the sort. It really rippled into a "movement" right before my eyes and I couldn't be more humbled. Your words are honest and I appreciate them. I told you you were a mover and a shaker.